With loads of contemporary patterned lamps and lively home accoutrement on the market, these days it’s easier than ever to satisfy that crazy pattern streak, no sewing knowledge necessary. Oooh, how I LOVE patterns. There’s something about them that makes me feel so fancy-pants, inspired to create homemade crafts like sweet aprons and mod neckties. 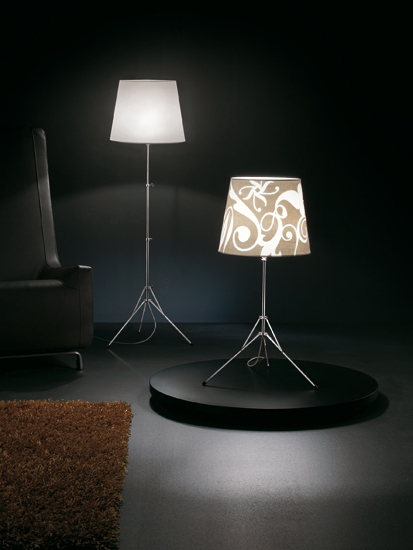 Created by fabric designers from Studio Out for Pallucco, the baroque pattern in the lamp shade is uniquely updated for today’s modern fashion sense, available in white with beige or white with black. The lamp’s composition makes me think of Versailles and the wallpaper that dresses its interior. An adjustable music stand-inspired base adds a certain musical tone to the overall look as well, perhaps inspired by musicians who once played for the palace royals? 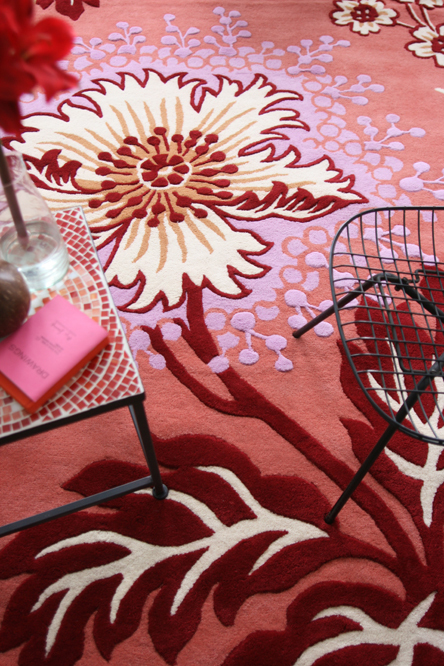 Perfect for adding a touch of patterned loveliness to an otherwise simple living room. If you’re not looking for a lighting fixture but still want to re-define a room with a unique design, rugs by Amy Butler will help even the most bland living room come to life. Made from 100% New Zealand wool, these luscious rugs are individually hand-carved by the artisans at Chandra Rugs, a fair trade company in India that practices sustainable methods of creating amazing rugs from Butler’s and other designers’ patterns. My personal favorite is Caracas– a spicy and bold look, just like the city. Its blood red leaves and sudden pop of pale apricot give the rug an energy and personality perfect for my hardwood living room floor. I mean, just look at the depth of the wool–I can practically feel it under my feet. Maybe I’ll get inspired one day to finish that patchwork quilt, but until then I think I’ll take enjoyment in the patterned Gilda and Caracas and leave the crafty handmade creations to Grandma.